This truly is the Best Classic Cream Scones recipe! Delightfully buttery and extra flaky, these cream scones are PERFECT for breakfast or as a tea-time treat. 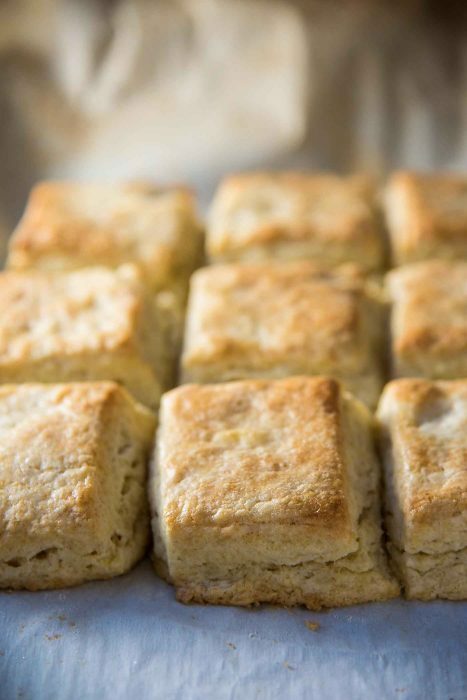 They are similar to American buttermilk biscuits, but flakier. Read the post for plenty of tips on how to make perfect classic cream scones! I love a good scone. Especially with some butter, or even better, with some strawberry jam and cream! 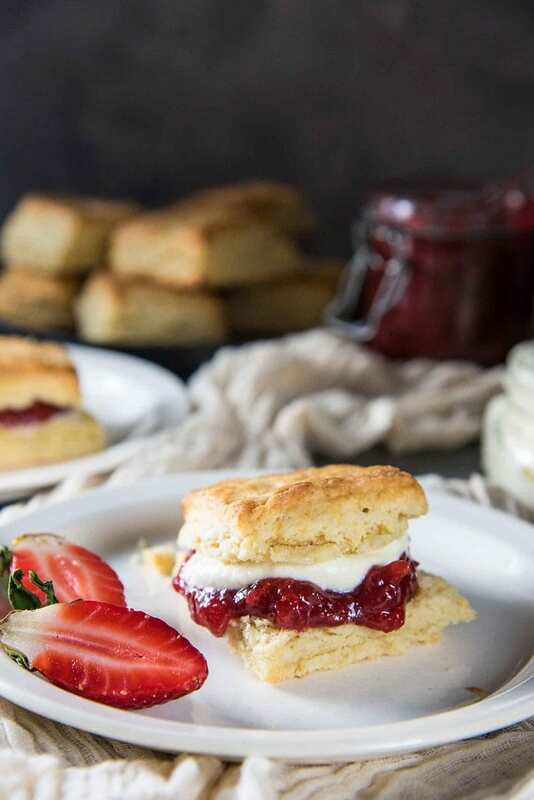 Scones are obviously a popular breakfast item, but they are also a great tea time treat to enjoy with a cup of tea or coffee. Scones hail from Scotland, but the modern rendition of a classic scone is vastly different to those original griddle-baked oat cakes. Scones today are delightfully flaky, soft, oven-baked goodies that are popular throughout Europe and Australasia. The dough doesn’t come together and looks clumpy or shaggy. 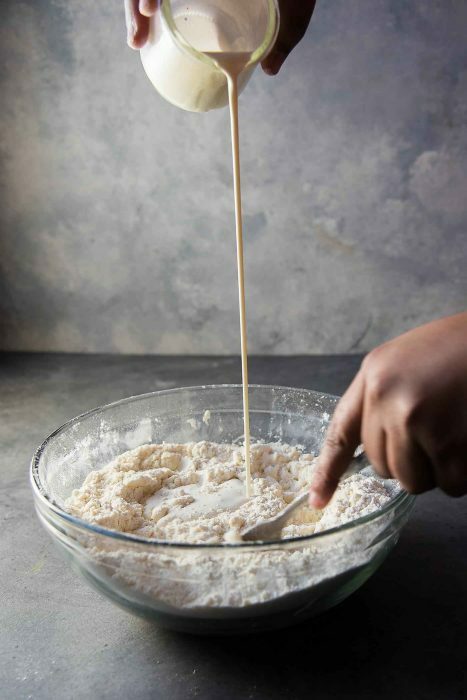 Use floured hands to bring the dough together. 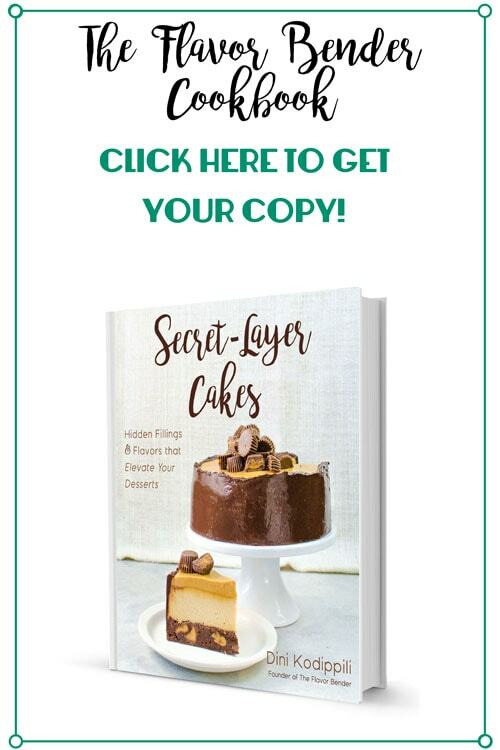 To create the layers, either fold over the dough, OR cut the dough in half and stack them. I prefer to stack the dough halves to create the flaky layers. Flatten the dough gently and repeat. Unfortunately, my client didn’t actually give me a recipe that I could replicate, since she used old tea cups to measure ingredients (! ), but she did say that getting the technique right was all I needed. 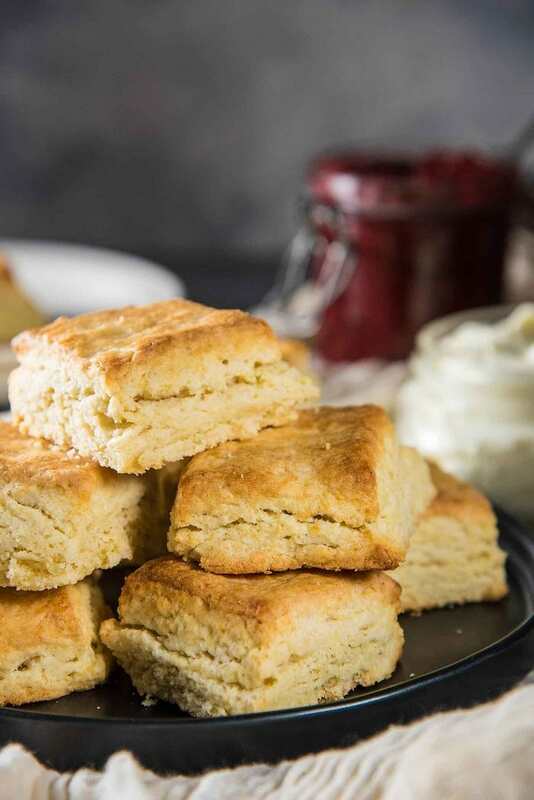 That wasn’t exactly the case, and after some trial and error, I’ve now got the BEST Classic Cream Scones recipe, and I’m sure you guys will love it too! So what makes a perfectly flaky classic cream scone? Cold ingredients. All the flour, butter and cream for this buttery cream scones recipe must be nice and cold. It’s important to keep little pieces of butter in the dough to help create more of that lovely flakiness. Handle the dough as little as possible. Do not over-mix the dough. The butter is rubbed into (or cut into) the flour, just like you would with shortcrust pastry. 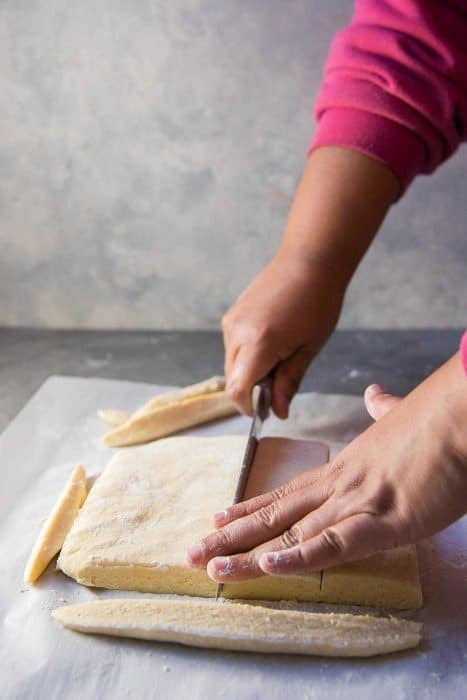 To create layers, the dough is folded, just like you would with puff pastry. However, to make it easier, I cut the dough and lay it on top of each other instead of folding it over. All these techniques help form the soft flaky layers in a classic cream scone. Dust the surface lightly with flour. 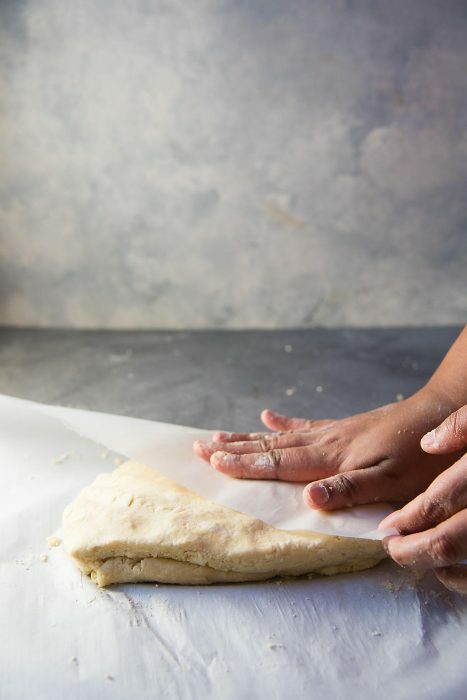 Use parchment paper to make it easier to roll out (with a pin) or flatten (by hand) the dough, to make it less sticky. Some scones recipes call for the addition of eggs. The classic scone is actually eggless. 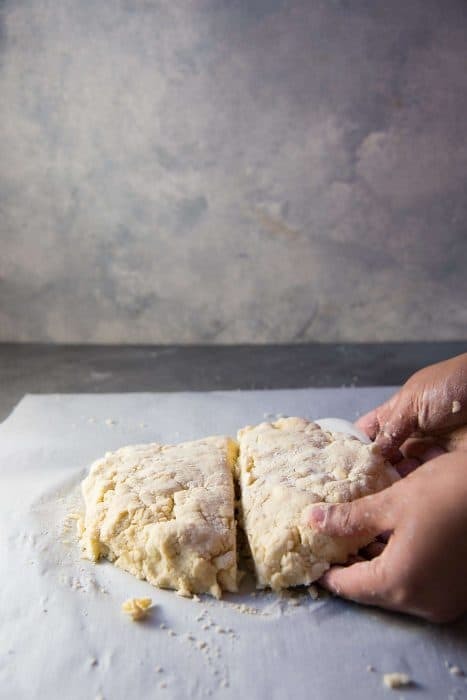 The crumbly scone dough is required to create the flakiness, and eggs are a binding agent that will reduce that flakiness. While there’s nothing wrong with adding eggs, for a classic, buttery, extra flaky scream scone, you shouldn’t add eggs. The other characteristic feature of classic cream scones (or any kind of scone) is the height. So how do you achieve that height in your buttery cream scones? When the dough is rolled out to be cut, make sure it has a height of at least 1/2 inch, or up to 3/4 of an inch. After baking, each scone will rise to about twice that initial height. Cut the scones with a clean knife or cutter. Clean edges help define the layers that will rise better (and taller). Wipe the cutter or knife after each cut, and dust it lightly with some flour for best results. Cut round scones, triangle scones or square scones. The shape is up to you. I prefer squares simply because it’s easier. Plus, I don’t have to “re-roll” the leftovers like you’d have to after cutting round scones. Freeze the scones for a few minutes before baking. For soft scone edges/sides – bake the scones with the sides touching each other. This will result in taller scones because they HAVE to rise up, but they will have soft sides. 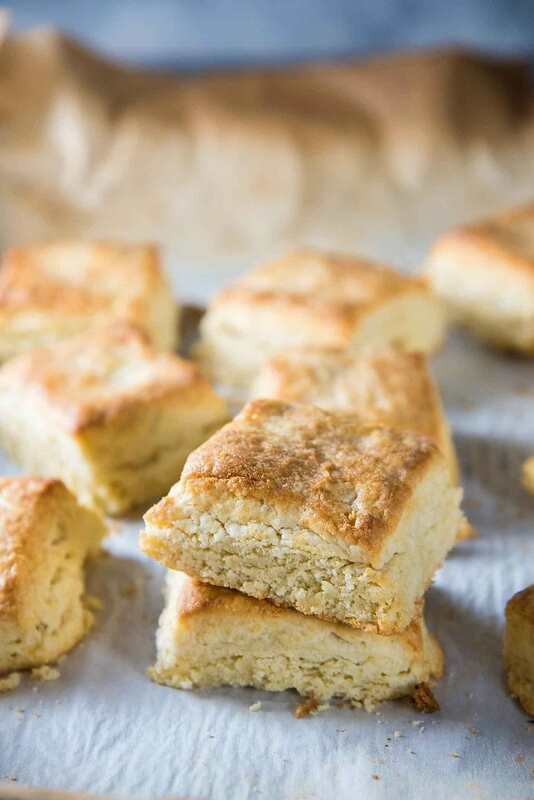 For crunchy, flaky edges/sides – bake the scones with at least 1.5 inches of space between each. This way the scones will bake with no interference from neighboring scones and have flaky, crunchy layers. For the best of both worlds – for soft and crunchy exteriors, I prefer to space them apart by just a little, about 1 to 1.5 cm. The scones will expand and touch each other at the base, giving soft edges at the bottom, but the top edges will be nice and crispy. Make sure to ONLY glaze the top. You don’t want any milk or egg wash to drip down the sides. It will interfere with the shape of the scones. Bake in a high heat oven. That initial high heat will cause the leavening agent to activate very quickly causing the scones to rise and expand quickly. 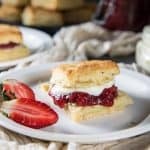 The Best Classic Cream Scones recipe - step by step recipe with tips on how to make perfectly flaky, buttery cream scones. Easy to make and addictively delicious. Place the flour, baking powder, baking soda, salt and sugar in a bowl. Add the butter. 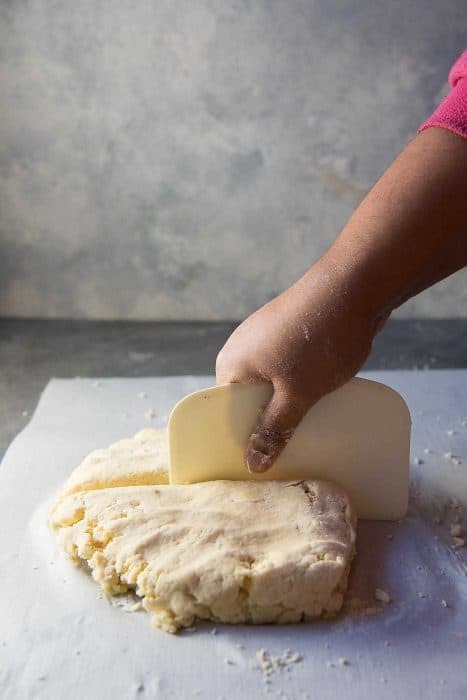 You can cut the butter into the flour using a pastry cutter, OR use your fingers to rub the butter into the flour. You should have pea sized butter pieces in the flour, while it looks coarse overall. Mix the vanilla into the cream, and pour it gradually into the flour and butter mix. Use a fork to mix the cream into the flour until it’s all incorporated and you have a shaggy looking lumpy dough. 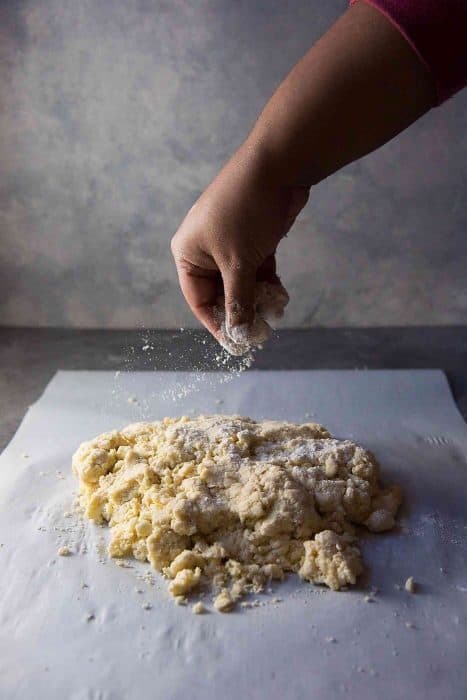 Turn the dough out onto a lightly dusted parchment paper (the same parchment paper that will be used to bake the scones). 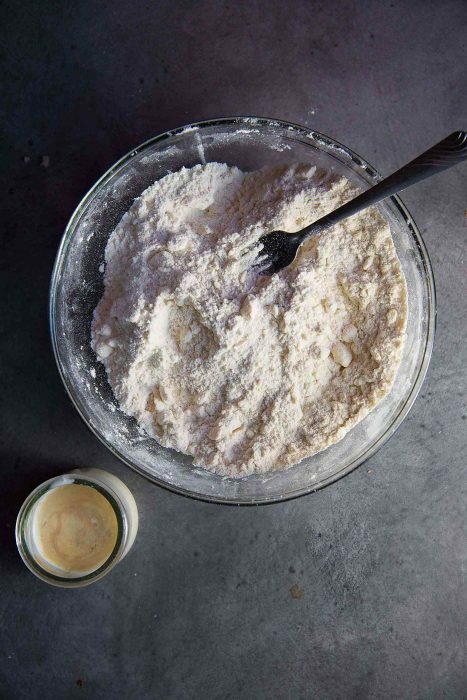 Lightly dust the surface of the scones, and bring the dough together to form a cohesive dough. 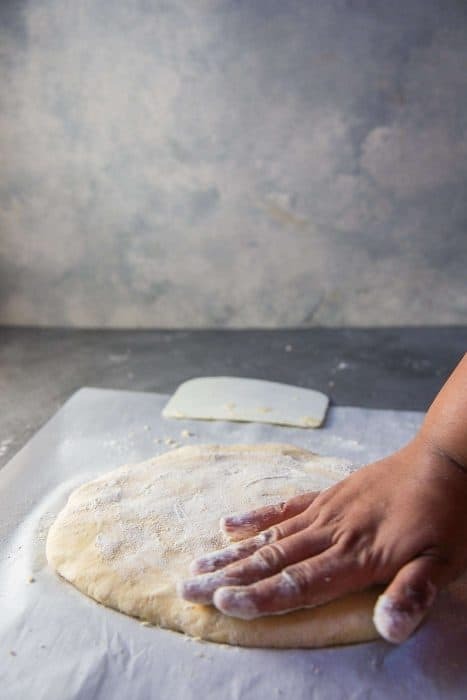 Pat the dough out to a 6 - 8 inch circle or square. Cut the dough in half, and place one half on top of the other. 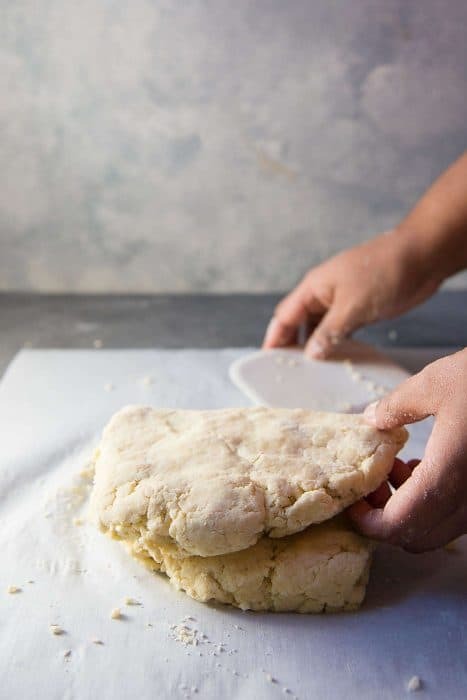 Place a parchment paper on top, and roll out the scone dough to another 6 - 8 inch circle or square (you can use your hands to pat the dough too). Repeat the process of cutting and layering the dough (once or twice more). 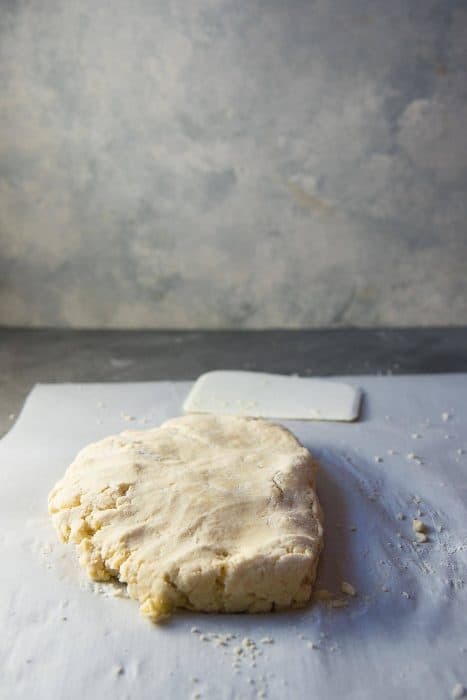 Final roll out - here you roll out the scone dough to a rough square while making sure that the dough is about ½ - ¾ of an inch high. Roughly cut and remove just the edges of the dough with a clean knife. Cut the dough into 16 pieces (4 x 4), making sure to clean the knife after each cut. Cut the scones STRAIGHT DOWN with a sharp knife, to make sure your scones have clean edges and will rise properly. 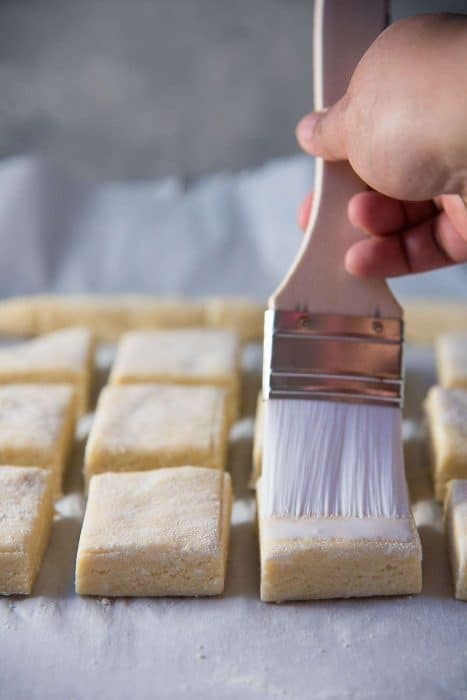 If you are using a biscuit cutter, lightly dust the cutter, and cut the dough straight down for clean cuts. Place the cut scones in the freezer for about 10 - 15 minutes until the oven preheats. Place the scones (with the parchment paper) on a baking tray. Separate the scones, as mentioned below, before baking (you may need to use a spatula to help release the scones off the parchment paper from the bottom). For soft sides - scones should be touching each other before going into the oven. For soft and crunchy sides - scones should be placed about 1 - 1 ½ cm apart. For crunchy sides - place the scones about 2 inches apart. Brush ONLY the tops of the scones with milk or cream. Sprinkle some coarse sugar on top of the scones (optional). Place the scones in the oven, and reduce the temperature to 400°F. Bake in the oven for about 20 minutes, until the scones turn a beautiful golden brown. Remove from the oven and let them cool down a little. Eat while warm, or if cold, warm them up in the microwave for about 20 - 30 seconds. Serve with butter, jam and cream. 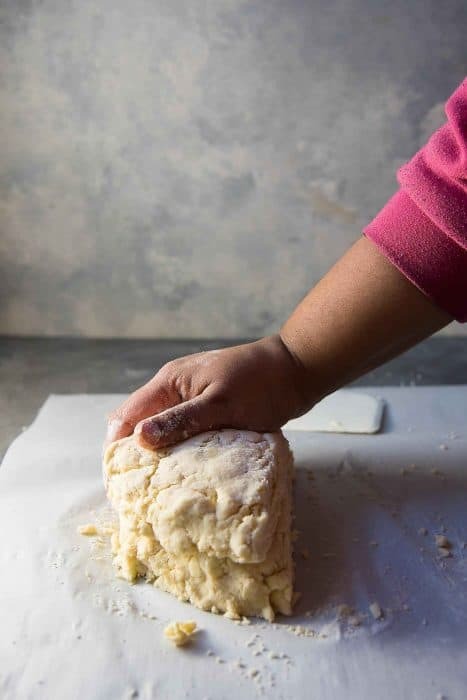 If you liked this classic cream scones (buttery cream scones) recipe, don’t forget to subscribe for new (and free) recipes by entering your email address on the side bar (and get all these recipes delivered straight to your inbox), so you don’t miss out on a thing. You can find me on FACEBOOK, TWITTER,INSTAGRAM, PINTEREST, YOU TUBE and GOOGLE-PLUS too. I made these yesterday and they were soo good. Taste was excellent and texture so soft n buttery and the outer crust was perfect! I just thought mine didnt rise as much as Id like it to,but will try to make them thicker next time. Sorry for the late reply. Measuring the weight of the ingredients does provide more accurate and consistent baking results. However, I have provided cup measurements in the recipe card now. Cream scones is something i want to eat everyday for breakfast, and possibly dessert and after dinner. They are so flaky and look fantastic , great tutorial! These look incredible! 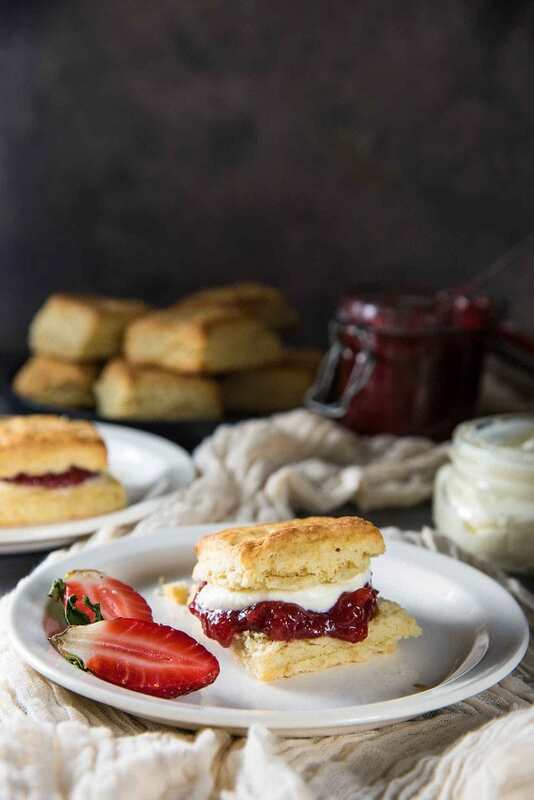 I’ve been obsessed with scones ever since my first trip to England, and I still have yet to find a recipe that is close to what I tried there. These might just fit the bill – fingers crossed! 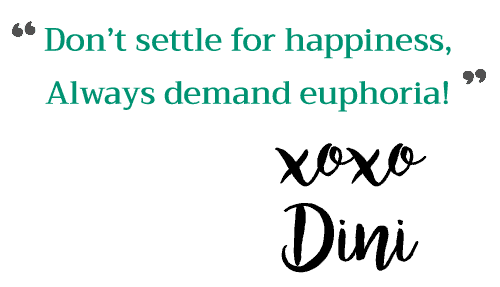 Thanks, Dini! These Scones are amazing! We are obsessed with them at my house! Oh my goodness. These are perfect naked. Buttery, flaky, crumbly carbohydrate goodness. Just the right amount of sweetness, and so easy. Thanks! what is the general rule for adding fruit or nuts to this recipe? if i’m adding blueberries or another juicy fruit, should i hold back on some of the liquid? I would add fresh blueberries instead of frozen blueberries because frozen berries have a higher water content and might make the scones too mushy. If you have fresh blueberries, you wouldn’t have to adjust the liquid content. You can definitely add nuts to these scones without changing the recipe too. I have added a heaped 1/2 cup of chopped nuts to this recipe with great results! Simple perfection. I can’t wait to try this one, cream scones are one of my favorite things in the world.